At its heart, Paleo is all about the search for optimal health. That’s why we spend so much time debating carbohydrates or lectins or the ratios of our PUFAs. But there’s something that’s often missing from this conversation: a definition of what, exactly, “optimal health” really is. Does it mean recovery from disease? Living until a certain age? Maintaining a healthy weight? How can you measure it, and how will you know once you’ve got it? If we’re taking optimal health as the ultimate goal of all our diet and lifestyle-related efforts, this is a question that we have to answer. Pursuing a goal won’t be very effective if you don’t even know what the goal is! Unfortunately, most people only have a very vague idea of what “health” means, and their definition is often based entirely on how a person looks, or focused exclusively on just one aspect of health, like athletic performance. 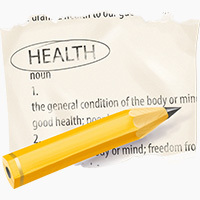 Sometimes, people even assume that they don’t need to bother defining “health,” because they’ll know it when they feel it. It’s true that most people have a rough idea of how good they feel at any given time, but unfortunately sickness is so normal in the modern world that our mental estimations of what “healthy” feels like aren’t necessarily accurate. How many people thought they were perfectly healthy until they discovered Paleo and realized that it was possible for them to feel better than they ever imagined? Yes, your body can tell you a lot about how healthy you are, but if you want to be as healthy as you possibly can, it helps to have some idea of what you’re looking for. Health is the mental and physical energy, vitality, and resilience to live joyfully in your own body and face the challenges of your life. Optimal health, then, would mean living like that all the time. This definition isn’t perfect, but at least it provides a background for getting into some of the finer points of what optimal health is and isn’t. Optimal health is more than the absence of disease. Not being sick enough to meet the diagnosis criteria for any particular disease is not as good as it gets. Too many people accept this as “health,” mostly because they think about “health” and “disease” as opposite sides of a coin, meaning that if you’re not sick, you must be healthy by default. This is only reinforced by doctors who focus on treating individual diseases, and then send their patients home when the treatment is done. In reality, “optimal health” and “disease” are more like the endpoints of a whole spectrum of different possibilities, and it’s perfectly possible to be not-sick without being in vibrant good health. Optimal health is individual. Note that the definition above didn’t specify “to live joyfully in your body at a BMI of 20 or below.” There is no one “perfect” height, weight, body composition, or diet and exercise routine that everyone should aspire to. 18% body fat might be normal and healthy for one woman, but her twin sister might be healthiest closer to 25%. Neither one is more or less healthy; they’re just healthy in slightly different ways. Of course, there are outer limits to the healthy range. No woman is healthiest at 8% body fat (she’d almost certainly be dead), and very few people are healthiest at over 30% body fat. But within the healthy range, there’s an infinite variety of shapes and sizes – the fact that our beauty and fitness industries only market a few of them doesn’t make the others any less healthy. Optimal health is more than skin deep. Plenty of physically attractive people are suffering from nutrient deficiencies or living with chronic diseases. The effects of these problems might not be visible yet (your bones can be weak and fragile from a calcium deficiency for years before you finally fracture something and realize that there’s a problem), but that doesn’t mean they aren’t real. In fact, outer beauty isn’t just an unreliable indicator of true health; it can actually be a sign of poor health and malnutrition. Especially for women, media ideals of beauty celebrate thinness to the point of emaciation, encouraging women and girls to starve their bodies of vital nutrients in pursuit of razor-sharp cheekbones and perfectly flat stomachs. In men, the constant push for one specific type of extremely lean, muscular physique can have equally dangerous consequences. The “beautiful” models who embody these standards only look the way they do because they’re fighting their bodies’ natural and healthy shapes. This doesn’t mean that healthy people don’t look good – far from it! Clear skin, shiny hair, and strong teeth are all consequences of optimal health. Maintaining an appropriate weight for your size is another aspect of health, although a physiologically healthy weight might not make you look like a cover model. But health is not about beauty; beauty is only one of the many consequences of health. Optimal health is more than athletic performance. Deadlifting 400 pounds, winning a marathon, or finishing a tough mudder doesn’t necessarily mean you’re healthy; it just means you’re fit. And fitness is part of health, but it’s only one part. Think of the runners who can barely walk up a flight of stairs because their knees are so wrecked: they might be able to win a race but are they really healthy? Professional athletes demonstrate an incredibly high level of physical performance, but many of them are actually quite unhealthy, because the demands of their sport are so extreme (remember Michael Phelps’ 12,000 calorie diet, including an entire pizza every night for dinner?). Of course, optimal health does include some level of fitness, but if meeting a performance goal compromises some other aspect of your life (for example, if you’re so chronically exhausted from overtraining that you don’t enjoy living in your body anymore), it’s actually unhealthy. Optimal health is mental and physical. It’s a state of body, but it’s also a state of mind – and more importantly, it’s a healthy, joyful, and respectful relationship between your mind and your body. If you’re constantly thinking about how much you hate your body, trying to ignore that you even have a body, or punishing your body for existing by pushing it through an exercise routine that you hate, the endless stream of negativity is cutting you off from the vibrant energy of living comfortably inside your own skin. Optimal health is a lived experience, not a “thing” you can “get.” You don’t “get” health once and then hang it up on your trophy wall forever after. It’s only meaningful as a something you practice in real life, something that changes the way you experience living in your body. Just like a pair of glasses improves the way you perceive things with your eyes, living in a state of good health is a lens that improves the way you perceive your physical existence. The same 10-block walk to the grocery store could be energizing and pleasant to a healthy body, or exhausting and painful to an unhealthy body – health is what changes your experience of the exact same physical actions. Optimal health is not the only worthwhile goal. 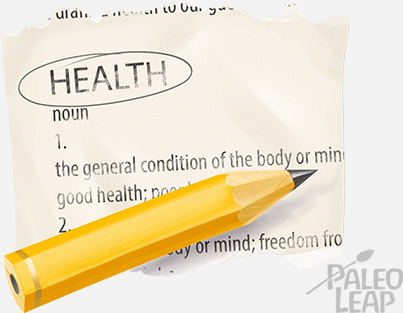 Some of us spend very little of our lives in a state of perfect “optimal health” by this definition. Who doesn’t have moments of hating their body, or days when just getting up out of bed is a struggle? But that’s actually OK – it doesn’t mean that you aren’t enjoying your life overall. Remember that health is a spectrum, and you’re not healthy just because you aren’t sick. By the same token, you aren’t sick just because you fall short of the absolutely optimal pinnacle of health. “Optimal health” just gives us a way to quantify one extreme of well-being; nobody is doomed to misery because they aren’t perfect. This article started exploring the topic of optimal health in order to help people set more useful and realistic goals. So what are the practical goal-setting lessons that come out of it? First, it highlights the importance of keeping the big picture in mind, even when you’re setting specific goals. Specific goals work best for helping you change your behavior, so setting short-term goals that cover just one aspect of health (“I will eat fish at least once a week”) is actually much more useful than deciding that “I will achieve optimum health.” For one thing, it gives you a concrete action to work on. But bear in mind that all these smaller achievements are means to an end, and don’t let them compromise the ultimate goal of optimizing your health. It might be useful to re-evaluate your smaller goals every month or so to see what affect they’re really having on your overall well-being. Secondly, it suggests that when you’re setting goals, it might be more useful to think about working towards or getting closer to optimal health, instead of focusing on a black and white contrast between “health” and “sickness.” This helps you set more realistic goals, instead of fixating on perfection and then hating yourself for failing. If you can now walk up a flight of stairs without getting winded when you couldn’t before, your health is more optimal than it was, even if you’re still carrying around 35 pounds that you’d rather get rid of. In the end, “optimal health” might not be an achievable goal for everyone, all the time. But having a concrete idea of what it means gives you a framework for evaluating your smaller goals, a measuring stick to see how well a particular self-experiment is working, and a reminder of why you’re going to all the trouble of taking care of yourself anyway. And who knows: the results of all that effort might get you closer than you think!